Signed (to the front cover by Bond cover girl Tuuli Shipster) UK 1st edn hardback. 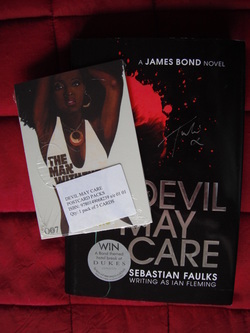 Accompanied by a limited edition pack (still sealed) of 5 promotional James Bond postcards, issued by Waterstone's at the time of publication. NOTE - provision of the cards is not guaranteed (supplies are limited) - if your purchase is conditional of receiving the cards, please contact me before purchase.